Severe Weather Kills At Least 14 People Across 5 Southern States : The Two-Way People are taking stock of the damage after heavy rain, flooding and tornadoes swept through over the weekend. 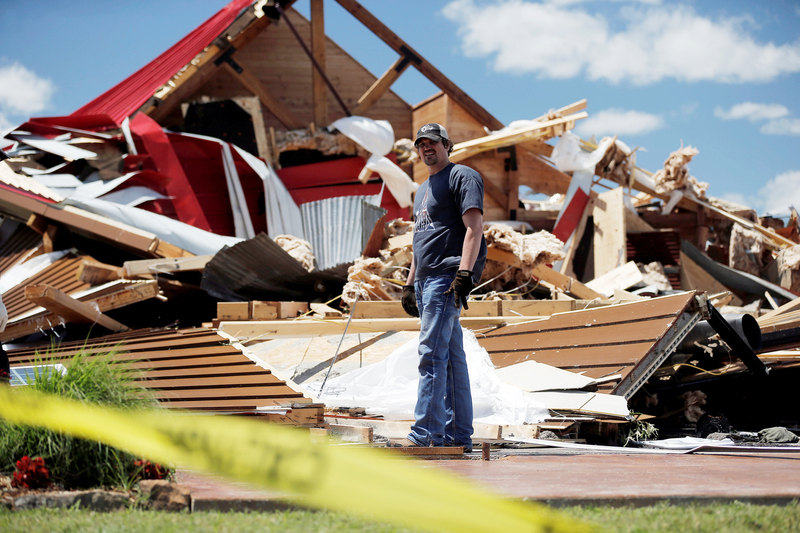 The American Red Cross is calling it the deadliest start to tornado season in nine years. Kris Ingram, a DJ hired to perform at a prom at The Rustic Barn, looks through debris for his equipment after the event venue in Canton, Texas, sustained major tornado damage on Sunday. People are taking stock of the damage after severe weather over the weekend killed at least 14 people in five Southern states. Flooding, lightning and tornadoes caused at least five deaths in Arkansas, four in Texas, two each in Mississippi and Missouri and one in Tennessee. The American Red Cross is calling it the deadliest start to tornado season in nine years. The National Weather Service says the severe weather is now moving northeast. Meteorologist Jared Guyer tells The Associated Press that "the greatest risk for severe weather today will be in parts of the Carolinas northward into Virginia, West Virginia, parts of Pennsylvania and even New York." Southeastern states from Florida to North Carolina could also see flooding on Monday, according to the NWS. Texas Gov. Greg Abbott told reporters on Sunday that more than 5,000 homes and businesses there sustained damage from four confirmed tornadoes in the eastern part of the state. All four deaths there were tornado-related, as member station KERA reports. "I've seen the rubble of what used to be homes," he said. "Where people lived, where their lives have been a part of for a long, long time." This photograph provided by the Warren County Emergency Management Agency shows what looks like a tornado as it approached Vicksburg, Miss., on Sunday. Texas' Van Zandt County sustained the worst damage, as Stella Chavez of member station KERA reported, and officials said one of the tornadoes may have been tracking on the ground for 50 miles. 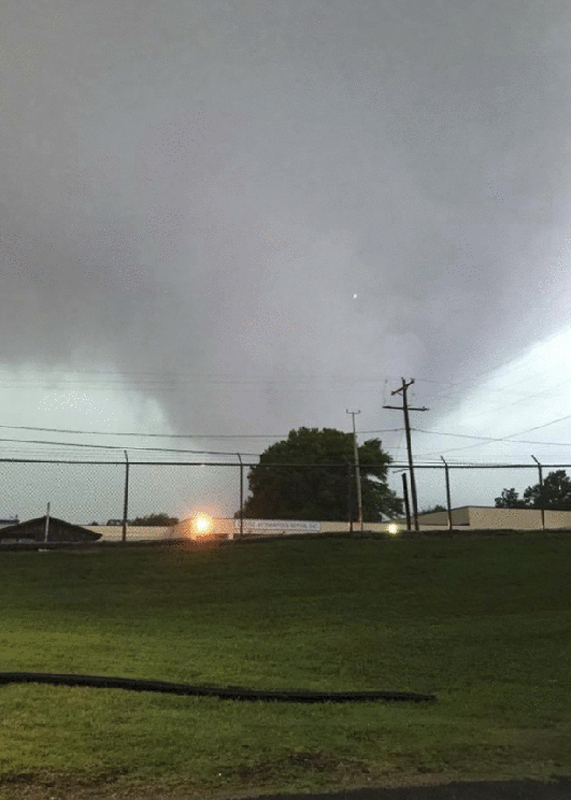 In the town of Canton, about 60 miles east of Dallas, at least 49 people were taken to hospitals with tornado-related injuries, Mayor Lou Ann Everett said. Damage there "is heartbreaking and upsetting to say the least," she added. "Crews began searching for survivors Saturday night, but downed power lines, gas leaks, heavy rain and additional reports of tornadoes hampered their efforts," KERA reported. "Door-to-door searches were being done Sunday." A dramatic rescue in Van Zandt County was captured on cellphone video and posted by local ABC station WFAA. It shows rescuers pulling a limp infant from an overturned, partially submerged vehicle and carrying her to a nearby truck bed, where one performs CPR. For several tense minutes, it's unclear whether the baby is breathing, as bystanders around her pray. By the end, she is gasping for breath. The baby's father later said that she was stable, according to the news station. The governors of Arkansas and Missouri have declared states of emergency over the storms and flooding. In Arkansas, the five people killed included a 10-year-old who was swept away in floodwaters, and a woman who was "riding an inner tube in a creek," according to member station KUAR. In addition, a volunteer fire chief was killed "when he was struck by a vehicle shortly before 4 a.m. while checking water levels" on a highway in the north of the state. The Cleburne County Sheriff's Office posted a tribute to the fire chief, Doug Deckard, saying he served as a firefighter for more than 40 years. It stated: "He was a wonderful member of our community, and his kindness, work ethic, and enthusiasm will be sorely missed." Some 71,000 customers in the state were without power on Sunday morning, according to Entergy Arkansas, though service to all but 15,000 had been restored by Monday morning. In Missouri, where two people died, Gov. Eric Greitens told reporters that the floodwaters reached record heights. "There are several places that have seen water levels several feet higher than anytime in Missouri's recorded history," he said. The Mississippi Emergency Management Agency said it has confirmed two deaths in the state, including a child killed by "an electric shock in floodwater." In Tennessee, a 2-year old was killed "after being struck by a heavy metal soccer goal that blew over in high winds," according to the Metro Nashville Police Department.